Registered nurses in the Philippines live a hard life as they practice their profession. 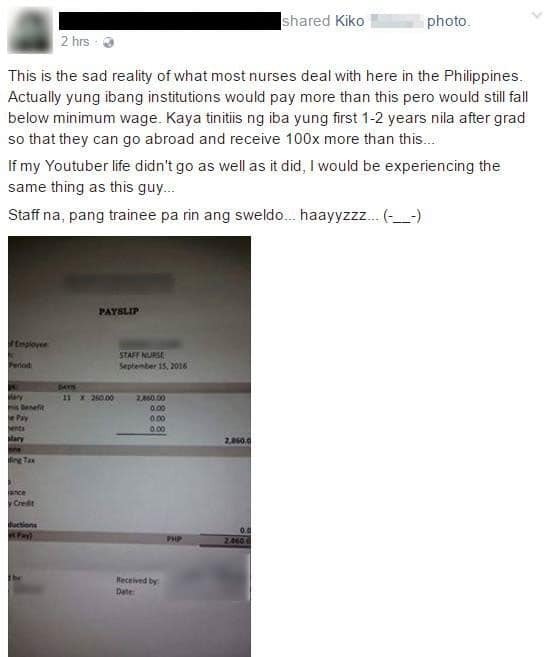 This can be seen in a Facebook post by a certain netizen named Kiko, which concerns a picture of a nurse’s payslip who is working in a Philippine hospital. The payslip shows a low salary. 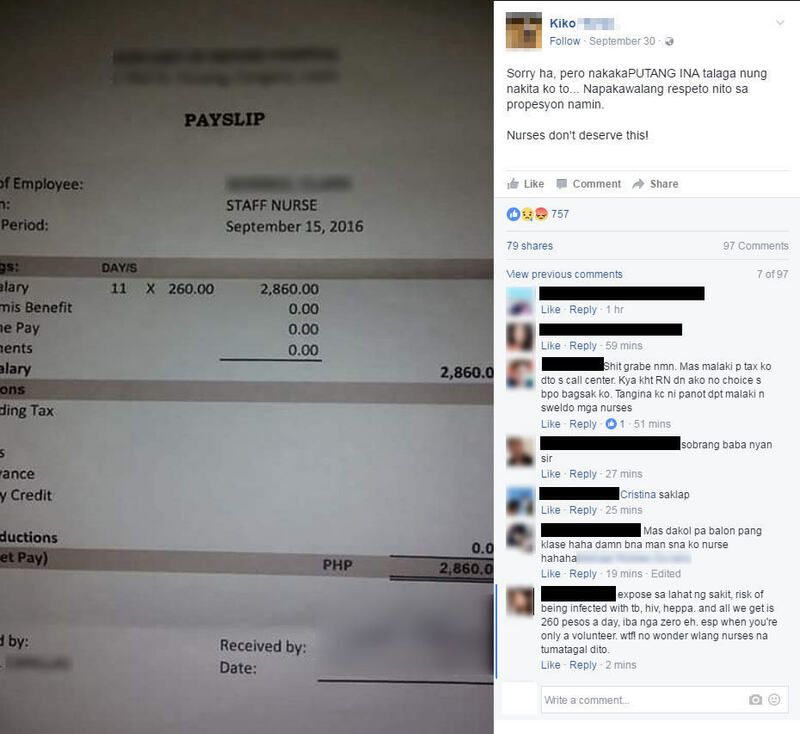 Other netizens reacted with indignation as they saw the payslip. 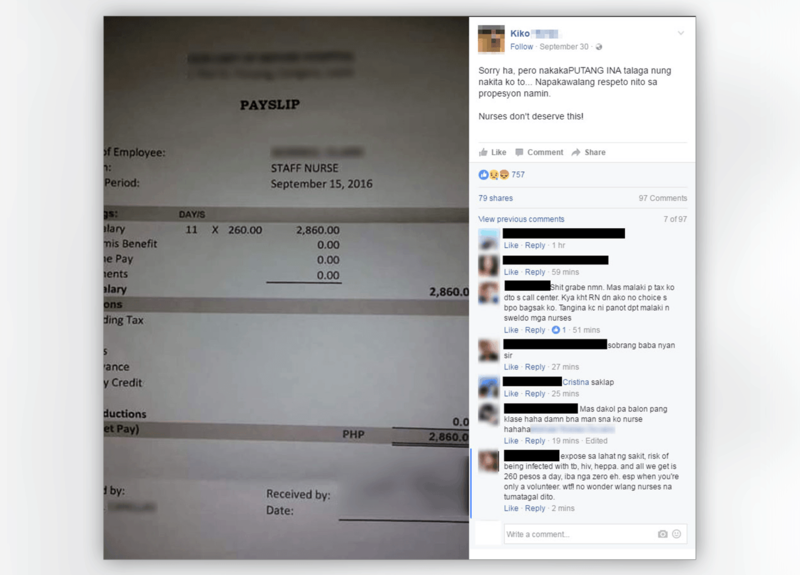 In the picture below, it can be seen that for the 11 days the Filipino RN worked, only Php 2,860 (USD 58.744) was earned, which everyone knows is not nearly enough for the average Filipino to live decently in the Philippines. Local nurses can really sympathize with this frustration since even O.R. nurses can work for an entire year without a single centavo to compensate them for their efforts. They get zero salary, as in nothing. Despite having absolutely no salary at all, they still work full-time and even overtime, as surgical operations, especially major cases, can last anywhere from six to ten hours. Work shifts can last a whopping sixteen hours; imagine having to work that long without any pay at all. If not for the social support system provided by their respective families, nurses working in such oppressive situations would surely go bonkers. They still stick around, however, because the experience they get in their work is invaluable in giving them the enhanced skills they need to be qualified enough to work abroad. Almost every nurse in the Philippines experiences this. That is why they were hopeful of the bill that should have been passed by Former President B. S. Aquino III into law, which states that they should get a minimum of Php 25,000 monthly salary. Aquino failed them, and so, nurses are now pinning their hopes on President Rodrigo Duterte to finally give what is due to nurses. Celine Francisco is a registered nurse/freelance writer/content strategist/teacher who found her niche in crafting human interest stories, creative non-fiction, and business. Believing in the power of the mind, she loves to tinker with the impossible and turn it into the simplest masterpiece.